The Magnetic Saw Guide is a woodworking tool designed by Steve Hines to help cabinetmakers and home woodworkers make clean cuts at compound angles using a handsaw. No need to carry a miter box, special saws or electrical power. The Magnetic Saw Guide sets up in seconds without tools, and uses your existing hand saw to make clean cuts at compound angles. The Magnetic Saw Guide is compact and rugged and folds flat for storage. Set the miter angle and tighten with the black knob. Clamp saw guide to the wood keeping the miter plate square with the wood. Set the bevel angle from -45° to +45°, using the scale on the hinge. Tighten it with the side handle. Let a hand saw snap against the rollers. The magnet grabs the saw making a satisfying ‘snap’ against the rollers, allowing a natural sawing motion. The magnet is recessed slightly below the plane of the saw, so there is no scraping. Once the user gets the feel for the sawing plane, the saw guide exerts no noticeable constraints on the sawing motion, but continues to guide the saw to provide a clean cut at the desired compound angle. A “V” groove on the bottom of the guide aligns the Magnetic Saw Guide to dowels, railings and other round stock. 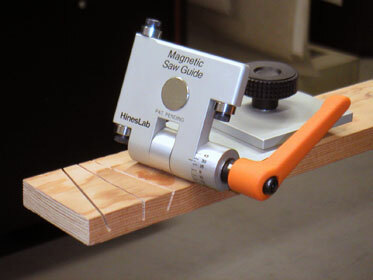 Keep a HinesLab Magnetic Saw Guide in your tool box for that next picnic table or Spruce Goose.